No actual information just self inflated bragging. Achieve more with less effort: The secret to weight loss, fitness, and wellness lies in the most basic and most overlooked function of your body - how you breathe. One of the biggest obstacles to better health and fitness is a rarely identified problem: chronic overbreathing. We often take many more breaths than we need without realizing it, contributing to poor health and fitness, including a host of disorders, from anxiety and asthma to insomnia and heart problems. 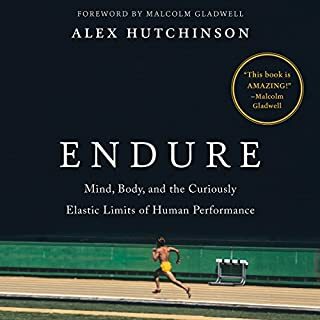 Writing from both the cutting edge of scientific discovery and the front-lines of elite athletic performance, National Magazine Award-winning science journalist Alex Hutchinson presents a revolutionary account of the dynamic and controversial new science of endurance. We live in a wonderful era of abundance, high-speed information and hyper-connection, but it also faces us with the challenges of mass-distraction, negative stress and analysis paralysis. 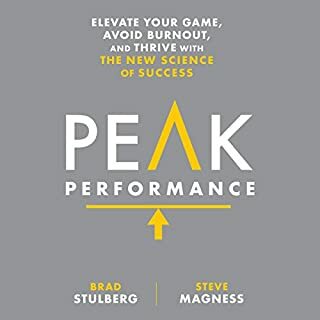 In this book you will learn how to leverage the opportunities of the modern world into a lifestyle of laser focus, masterful mindfulness, and personal freedom. After running an ultramarathon through the Copper Canyons of Mexico, Christopher McDougall finds his next great adventure on the razor-sharp mountains of Crete, where a band of Resistance fighters in World War II plotted the daring abduction of a German general from the heart of the Nazi occupation. Deep is a voyage from the ocean's surface to its darkest trenches, the most mysterious places on Earth. Fascinated by the sport of freediving - in which competitors descend to great depths on a single breath - James Nestor embeds with a gang of oceangoing extreme athletes and renegade researchers. He finds whales that communicate with other whales hundreds of miles away, sharks that swim in unerringly straight lines through pitch-black waters, and other strange phenomena. Thinking all monasteries were like the ones he saw in the movies, Jesse Itzler arrived at the New Skete religious community in remote Cambridge, New York, with a shaved head and a suitcase filled with bananas. To his surprise, New Skete monks have most of their hair. They're Russian Orthodox, not Buddhist, and they're also world-renowned dog breeders and authors of dog-training books that have sold in the millions. Eat Better. Train Better. Think Better. Be Better. Joe De Sena has one ultimate goal: to help improve everyone’s physical and emotional health by teaching them the tenets of Spartan living from ancient Greece: simple eating, smart training, mastering resilience, and an all-out commitment to achieving a goal. Very thoughtful (and physical) book. Why we think it’s a great listen: Want to join the “superhumans”? Luckily you don’t have to run to catch up with them, thanks to McDougall’s and Sanders’ inspiring (and motivating) journey through history, science, physiology, health, entertaining characters and unlikely friendships. Full of incredible characters, amazing athletic achievements, cutting-edge science, and, most of all, pure inspiration, Born to Run is an epic adventure. The greatest athletic performances spring from the mind, not the body. Elite athletes have known this for decades, and now science is learning why it's true. In his fascinating new book, How Bad Do You Want It?, coach Matt Fitzgerald examines more than a dozen pivotal races to discover the surprising ways elite athletes strengthen their mental toughness. The health you enjoy today, and for the rest of your life, begins with your next breath. In fact, breathing is so crucial to your body's ability to heal and sustain itself that Dr. Andrew Weil says: "If I had to limit my advice on healthier living to just one tip, it would be simply to learn how to breathe correctly." International fitness icon, nutrition expert, and professional big-wave surfer Laird Hamilton offers his take on human resilience, relationships, business, technology, risk-taking, and the importance of respecting the natural world, all through the lens of his life both in and beyond the ocean. Inspirational on many levels... thank you! What Doesn't Kill Us, a New York Times best seller, traces our evolutionary journey back to a time when survival depended on how well we adapted to the environment around us. Our ancestors crossed deserts, mountains, and oceans without even a whisper of what anyone today might consider modern technology. Those feats of endurance now seem impossible in an age where we take comfort for granted. But what if we could regain some of our lost evolutionary strength by simulating the environmental conditions of our forbears? Investigative journalist and anthropologist Scott Carney takes up the challenge to find out: Can we hack our bodies and use the environment to stimulate our inner biology? Helping him in his search for the answers is Dutch fitness guru Wim Hof, whose ability to control his body temperature in extreme cold has sparked a whirlwind of scientific study. Carney also enlists input from an army scientist, a world-famous surfer, the founders of an obstacle course race movement, and ordinary people who have documented how they have cured autoimmune diseases, lost weight, and reversed diabetes. In the process he chronicles his own transformational journey as he pushes his body and mind to the edge of endurance, a quest that culminates in a record-bending 28-hour climb to the snowy peak of Mt. Kilimanjaro wearing nothing but a pair of running shorts and sneakers. An ambitious blend of investigative reporting and participatory journalism, What Doesn't Kill Us explores the true connection between the mind and the body and reveals the science that allows us to push past our perceived limitations. What did you love best about What Doesn't Kill Us? 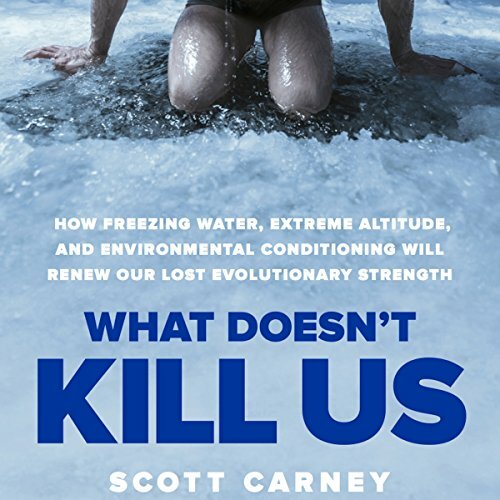 I'd heard of Wim Hof already however, I realized that Scott Carney used Hoff as an anchoring idea to then launch off in a number of different directions around the idea of tempering your body/mind to endure discomfort. What was one of the most memorable moments of What Doesn't Kill Us? The trek up Kilmanjaro was a very memorable chapter. I won't spoil the story but suffice it to say it was a very human moment to realize that even 'hero's' have ego's and are prone to being self centered. Have you listened to any of Scott Carney’s other performances before? How does this one compare? No but it has made me intensely interested in learning more. I appreciated the fact that Scott showed that a regular guy can put these ideas and techniques to use and have some significant benefit. There are a host of podcast episodes out there on Wim Hof, Brian Mackenzie, and Laird Hamilton among others. More than enough fodder for someone interested in learning more. Listened to the whole thing in 3 days of house painting. Scott connects the dots between methods taught by Wim Hoff and some of the most inspiring athletes and teachers in the health and fitness space. He brings his humble character to make this incredible journey accessible to the rest of us mortals and dispels his own healthy scepticism. it is an intelligent exploration into reclaiming the innate capacity within an ordinary human that put his life on the line. This story is supported by weak evidence and essentially is a narrative of the authors journey to changing his physiology and him climbing Mount Kilimanjaro. 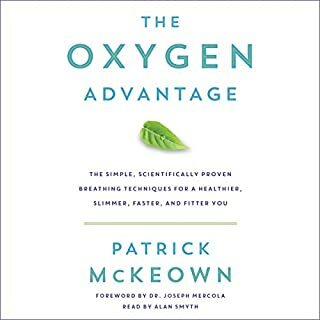 Here is the jest of the book: breathing more elevates your oxygen saturation, exposure to cold burns more kilocalories and provokes your body to create more mitochondria. New to the theme? then your in for a treat. If you are fully aware of WIM HOF, and coldwater treatment etc.. then this wil be slightly boring, especially the last 5 chapters. theres some cool history in here, talking about different wars, and how climatization were a critical factor. How to hack you body, its all there. All that is left is to find some cold water to practice the method yourself. I really enjoyed the book and clarity at which the author read it. This book was the validation that I was looking for after reading and listening to many sources on cold exposure and focused breathing. I had an expectation based on listening to an interview with the author before purchasing. My expectations were exceeded with the product. Well done. I checked out this book Because of its introduction to Colf therapy for personal development: physically, mentally, emotionally, and as an immune suppressant or autoimmune conditions. It is an excellent introduction to those things along with an ongoing narrative. It is based on evolutionary theory which I'm willing to listen to and consider Arguments for but give me good science and don't talk about science that you don't really understand. I do teach biology and some Liberties were taken in connecting biological processes to assumed evolutionary origins of those processes. In addition, I was not interested in the authors connection to Evolution and global climate change. That's not what this book was about. I can buy and read books about that. Stay on topic. Because two things appear to be happening at the same time does not mean one caused the other, correlation is not necessarily causation. It is false logic to assume that because things are happening at the same time that one must have caused the other. Provide evidence if you're going to make that assertion rather than assuming I'm going to agree with that conclusion. The author introduces us to several good programs related to cold Therapy and Fitness in general. I'll probably listen to it again because I now own it on audio. But, the topic wondering does not rate the full five stars. Great book. Great method. I've started cold therapy and breathing meditation and without hesitation can confirm that something is definitely at work. I feel more alert, have lost weight, and have increased work capacity. I'll be listening again and recommending this book and Wim Hof method to anyone that will listen. didn't really glean anything from this. the VICE video on Wim Hof online gives you everything you need to know. this book is filled with unnecessary filler to bulk it out into a book. Wonderful hole hearted story about Scott's journey with Wim Hof's method, endurance trials, meetings and experiments with world class athletes. Scott also knows his physiological science. I just loved the detailed descriptions of events and the personalities. Wish there was more chapters. Don't buy if you are in a hurry just to learn the methods. Must be enjoyed like chocolate - slowly. This is one of my favorite self growth books ever. Mostly brilliant information, particularly physiologically, but slightly over-written. Perhaps easier to follow without so many unnecessary descriptions of people/places/situations. A fabulous mix of research and adventure into the limits of human endurance using simple, powerful and generally uncomfortable exercise regimes. 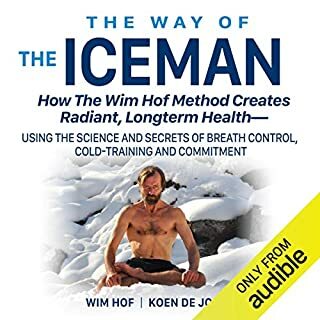 If you have an interest in the wim hof method , or just passing curiosity , then this is a great audiobook to buy !! Great insight into the iceman and how the cold can change lives with facts and research to back it up. Wonderful that this was narrated by the author. Gripping and inspiring. Listened in two straight days and am just about to listen again. Have started the breathing and cold showers and am fighting my cold phobia, think I will win. If you want to truly understand Wim Hof and humanity’s need to return to nature listen to this! Thanks Scott! Much of the book is about the Wim Hof method and Scott's experience with meeting and training with him personally. I really like books which are read by the author, it adds a level of authenticity which is hard to replicate. This book did not disspoint. I have recently discovered Wim Hof and think what he teaches is incredibly interesting and can no doubt be life changing. With the author’s pedigree and the tag line of this book I thought would mean quite a subjective and wide-ranging look at the science behind this ‘method’ and way of thinking about breathing/cold exposure/meditation. Whilst I very much enjoyed the book, the author I think fell victim to his own sense of importance in the equation with the effect that many times in the book it felt like he was trying to aggrandize himself to perhaps share in some of Wim Hof’s fame. Do I really care that Orlando Bloom was training in a pool with other celebrities - absolutely not - who cares he is nobody special. Its like telling a story where you start by giving the nationalities or religious persuasion of the people involved when it has ABSOLUTELY nothing to do with the story. I wish there had been more real accounts from practionners of the method, with their high and low stories which would then help the reader to be able to form a more well-rounded opinion. That said it was certainly worth the read and was very enjoyable overall. Good book. Good story but a few points wrong. I am a freediving instructor. How to breathe properly is very important. Saying you get high on oxygen is rubbish.. I have breathed pure o2 and hardly noticed it. The reason you get dizzy is because you are experiencing cellular hypoxia. That is why you can pass out while sitting there hyperventilating. You are actually unable to access the o2 in your body. You loose your true ability to survive underwater holding your breath. You can definitely go longer by normal tidal breathing ... but only if you are truly mentally tough. You did inspire me to do more but I will do it by breathing properly. I would absolutely recommend this to a friend. This book offers a great mix between story telling, and being educational. At times it can seem a little repetitive but I think this is a good thing in this instance. He rubbed ice himself, with steam erupting off of his body. I have listened to it in one sitting, and repeatedly since. If you close your eyes, you can almost convince yourself the book is being read to you by Ryan Reynolds, which is kinda fun. It's a great book, especially if you have just discovered Wim Hof methods. It dives deeper than the method and explores many scientific aspects of it and it is mostly told through entertaining stories. Absolutely loved it! The concept makes so much sense. It has changed my life and the way I perceive comfort and the cold. I will be recommending this to everyone. The way Scott delivers it as well keeps you enthralled and wanting more. Talking about this with everyone I know! Really enjoyed the analytical and investigative perspective of this book. To look at this from all sides made it so much more interesting and has opened up for amazing discussions. Biggest take away is about why its so important to move away from comfort. I would recommend this book! A thoroughly enjoyable and thought provoking read. 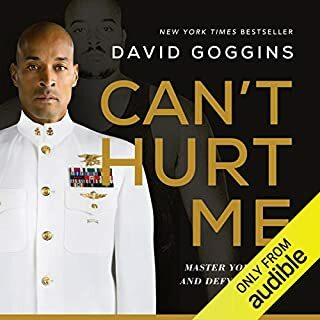 Excellent narration and well written book on one mans journey to get out of his comfort zone and discover his inner strength against the environment but more importantly against his own doubts of humans adaptability and strength. Recommend to anyone on path of self discovery and remember...just breathe! 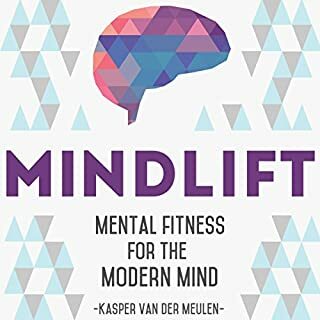 One of the best books I've ever read, inspired me to study the Wim Hof Method, currently im on week 3 of the 10 week programme and feel great for it. Cheers Scott, will definately read some of your other work. Book was easy to listen too and is a good one for this type of format. Loved the story and have taken up the cold showers. Great listen, awesome to hear the story of 1 very strong man and many other strong people. Finally, someone who can articulate the breakthroughs achieved by Wim Hof better than the man himself.